Look for Rhythm Core Alpha 2™ in the Nintendo eShop, now available for download! 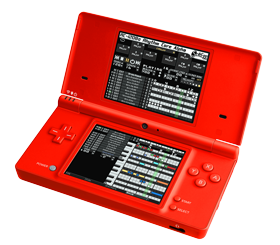 Make Music with Nintendo DSi™ & Nintendo 3DS™! Rhythm Core Alpha™ and the new Rhythm Core Alpha 2™ are advanced music creation systems for the Nintendo DSi™ and Nintendo 3DS™ game systems. They are designed for creating and performing live music in-front of an audience; electronic instruments designed for PERFORMING! Our 2D solo mode allows one to play the screen by drawing with the stylus. The key and scale can be set so that one can never hit a wrong note! You can even play the drums from the Nintendo DSi™ or Nintendo 3DS™ screen! Rhythm Core Alpha 2™ adds nine more solo screen variations, including 1,2, and 3 row piano keyboards, an 8-way note grid (in addition to the original 6-way grid) and wide versions of both of those to allow using your fingers to play. It also adds a separate drum screen for playing drum solos, and a mixer screen for fine adjustment of the volume and panning of every track. Setting up a drum beat is nearly instantaneous with its twelve (12) track DRUM GRID. You can choose between 122 different and unique drum sounds in the original Rhythm Core Alpha™, and 144 sounds in Rhythm Core Alpha 2™! Creating instrument parts is fast and easy using the traditional MIDI-style piano-roll editor. Eight (8) different instrument sounds can play at once, using any of 166 different instrument sounds in the original Rhythm Core Alpha™, and 225 sounds in Rhythm Core Alpha 2™. Notes can be of any length. Rhythm Core Alpha 2™ allows you to record your soloing into a track, for even quicker music creation! A full set of editing commands are available for building your drum and instrument tracks: Copy, Shift, Set, Clear, Random, Echo, Velocity and Transpose! Up to 64 beats can be set for each track in each loop block. Furthermore, a full ADSR volume envelope control is available for every track, allowing for great customization for each sound. Rhythm Core Alpha 2™ adds vibrato, portamento, echo, fine and coarse pitch adjustment, pitch envelopes, and envelope curve controls to your sound generation options. These capabilities improve the quality and expressiveness of the sounds incredibly! It also lets you rename the sound for each track, and copy the sounds to different tracks. Rhythm Core Alpha™ automatically detects the possible keys and scales for the music you have entered, and allows you to change the key and scale instantly by simply pressing a Button or a direction on the +Control Pad. By using the shoulder buttons as shift-keys, 24 different key/scale combinations can be selected, from 120 possible options that you can choose to assign to each button. So, much as one changes chords when playing guitar, so can chords be changed even easier in Rhythm Core Alpha™! Rhythm Core Alpha 2™ adds a “shift” function that can be used to transpose notes while staying in the same key. Up to 100 different loop blocks of drum and instrument notes can be created, and then sequenced in the pattern editing mode. You can even edit one block while another block is playing! (Rhythm Core Alpha 2™ adds a “Block Lock” mode where you always see the playing block.) In the pattern mode, the block, key, and scale changes can be set. Rhythm Core Alpha 2™ also lets you specify a note “shift” within that key/scale. A very powerful feature is that loop points can be added to allow a chord progression to continue indefinitely until the user decides to break out of it. The face buttons on the system can be set to jump to different patterns or blocks completely under user control, allowing for the maximum flexibility for live performances! One can even set the patterns so that they allow the user to change the chord or block independently of the other sequenced changes, for even more performance options. Rhythm Core Alpha 2™ and the European release of Rhythm Core Alpha™ allow you to record your live chord and block changes directly into the pattern! They also give you advanced pattern editing capabilities. The chord changes can also change the notes available for the solo mode, allowing for carefree soloing without worrying about hitting a wrong note! Rhythm Core Alpha 2™ also adds many file export features, including the ability to export a MIDI file of your work to an SD card, and the ability to import and export individual blocks (loops) of songs for use in later compositions. Rhythm Core Alpha 2™ comes with 91 built in loops and beats for using in your own songs, and 13 demo tracks by chiptune artists Lucky Button Pusher, Terence James (of Here Between You Me), Timon Marmex, and Tina Belmont. At an retail price of 500 Nintendo Points (US $5, Europe €5), Rhythm Core Alpha™ provides unparallelled control at unbeatable price! Rhythm Core Alpha 2™ is available for 1000 Nintendo points, or $10 US ( €10 ) adds three years work developing new features and adding refinements learned from years of live performances. Look for it in the Nintendo eShop on Nintendo DSi™ and Nintendo 3DS™! Rhythm Core Alpha™ and Rhythm Core Alpha 2™ are now available throughout the Americas and Europe, and in the UK, Australia and New Zealand! Nintendo DSiWare is a trademark of Nintendo. © 2009 Nintendo.